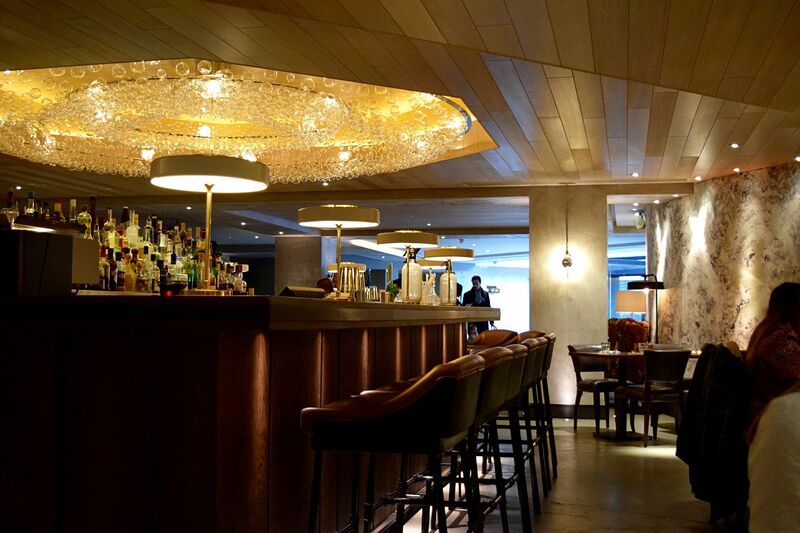 100 Wardour Street has taken over from famous Soho spot Floridita and has been turned into a restaurant and late night bar. 100 Wardour Street aims to become one of the go to Saturday brunch spots in London, so of course we went to check it out. The first thing you will notice walking into 100 Wardour Street is it’s a bright open space and the second is the concierge who will be there to greet you. The restaurant itself is pretty large and there is also a bigger back room, which could be perfect for a group brunch or celebration, as well as large bar which adds a New York vibe to the top floor. Our table was up from the bar in the middle of the restaurant and it was looking busy for a Saturday afternoon, always a good sign – maybe. The menu is varied for Saturday brunch. There is the option of two courses £18.95 or three £22.95 and with a variety of dishes on offer including pastas, fish and a good selection of meats, it will cater to most. As it was just after lunchtime and knowing brunch is usually pretty big, we decided to go for the two course option thinking it would have been the safer option, this appeared to confuse our waitress who was obviously used to everyone picking the three course option. Paula decided to compliment brunch with the bottomless Prosecco, which you can add-on for £15 and I went for the bottomless Bloody Mary’s. As we went straight to mains, Paula chose the seabass with harissa potatoes and fennel yogurt and I went for the Rigatoni pasta with veal ragu. Something Paula and I noticed from the moment we sat down was that it really did feel like a new restaurant, in that the staff were a little nervous and appeared slightly untrained and this then rang true from the waitress taking my order down wrong and unfortunately even when corrected, the wrong pasta dish was delivered. The waiter who delivered my pasta was actually pretty rude bringing over the ticket to prove that his colleague entered the ‘right’ food order in. We also waited a long time for our drinks and couldn’t help but notice the confused looking waiter wandering around with a Bloody Mary. 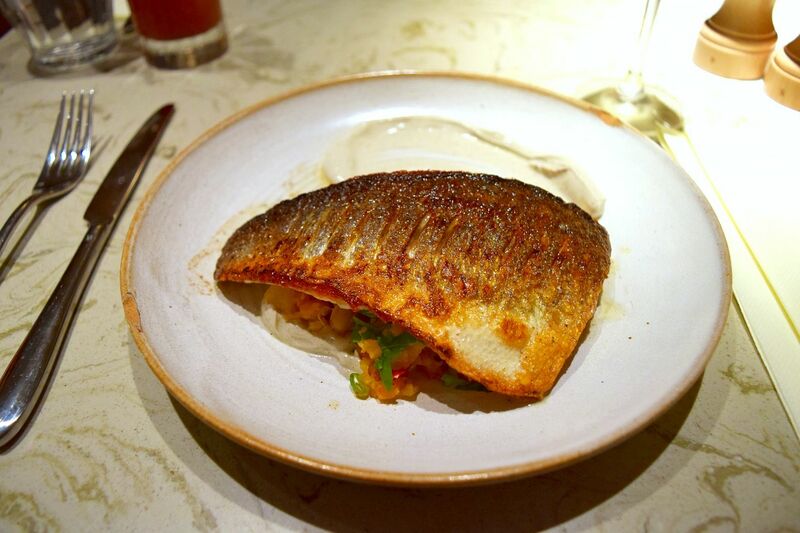 However with that said Paula really enjoyed her seabass main course, the potatoes and fennel yogurt complemented the pan cooked crispy skinned seabass really well and it was filleted to perfection, with not one bone in site. 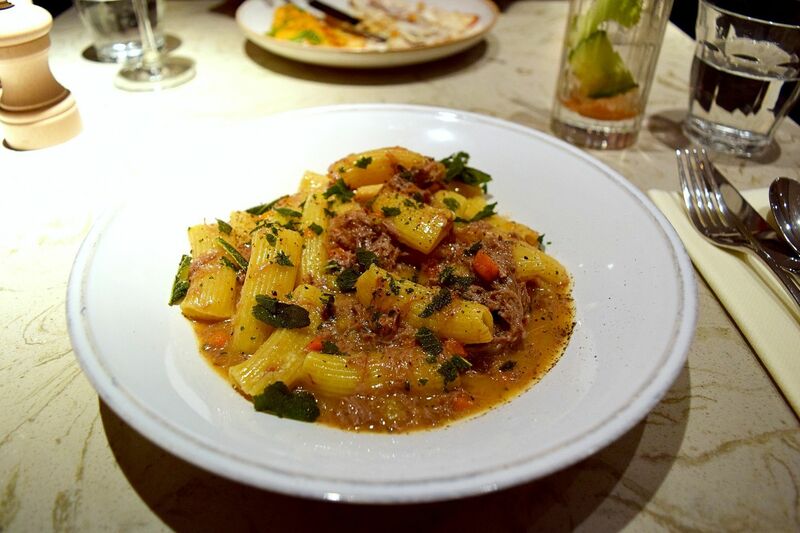 After my dish was corrected the veal ragu rigatoni was actually really tasty, the pasta was still slightly al dente, the veal was delicate and went brilliantly with the ragu sauce. Like the seabass the pasta dish was on the small side but I could have happily eaten another bowl. For dessert we decided to choose what to have after eating, which again seemed to confuse the waitress who was looking to take our whole order the minute we walked in. I had the Izu’s French Toast with tonka bean ice cream as it was highly recommended in a previous review we read before visiting. 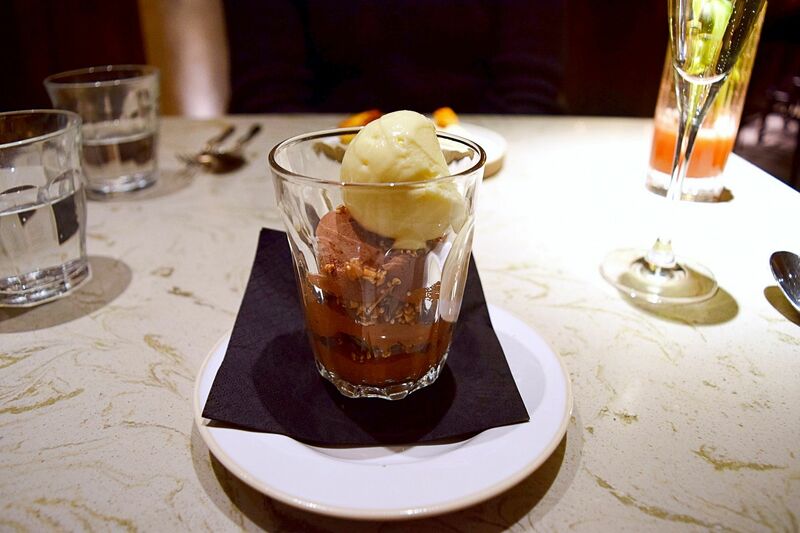 Paula chose the chocolate ganache with nut crunch and milk ice cream. The desserts were on the small side, which on reflection, would be fine if you were having three courses possibly. Paula’s chocolate ganache was very thick and extremely chocolatey, if you like a strong cocoa flavour this a safe bet for you. My dessert was pretty to look at but again slightly small, the French toast had a strong taste of caramel, the top was crunchy as you would expect and the centre had a soft creamy texture. 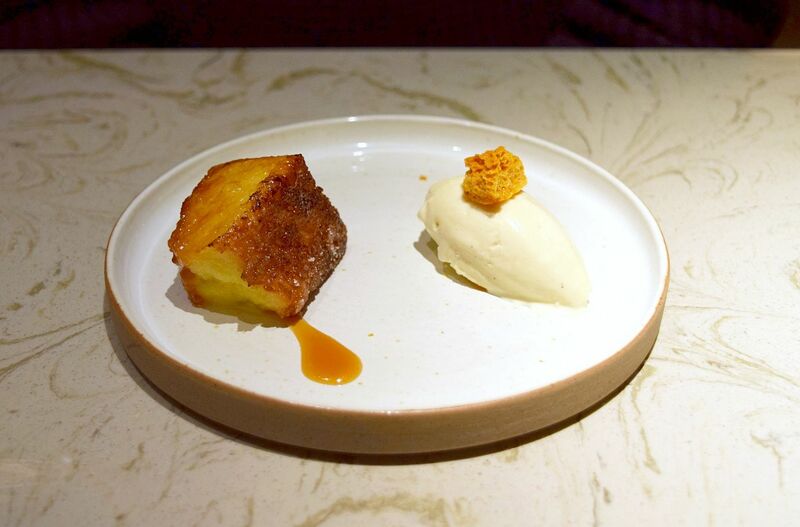 I personally didn’t like the tonka bean ice cream, the flavour was quite overbearing and powerful and my personal preference would have been to have a simple vanilla ice cream instead. Something the waiting staff try to do well is replace and top up your drinks, your water is kept topped up as is your Prosecco, the Bloody Mary’s on the other hand were quite good or very bad, one looked like it was frapped and had no ice in it. Our waitress also brought another over after saying I didn’t want one, lucky they were bottomless. I would highly recommend you are very specific on what you order and if you want something a particular way be very clear with the waiting staff. All in all the visit was hit and miss, it’s one of those brunch places you would probably go back to and give it another go, as the service can easily be improved and was probably down to the restaurant recently opening. The main dishes were good and we would both happily eat them again, whereas the desserts weren’t anything particularly special. 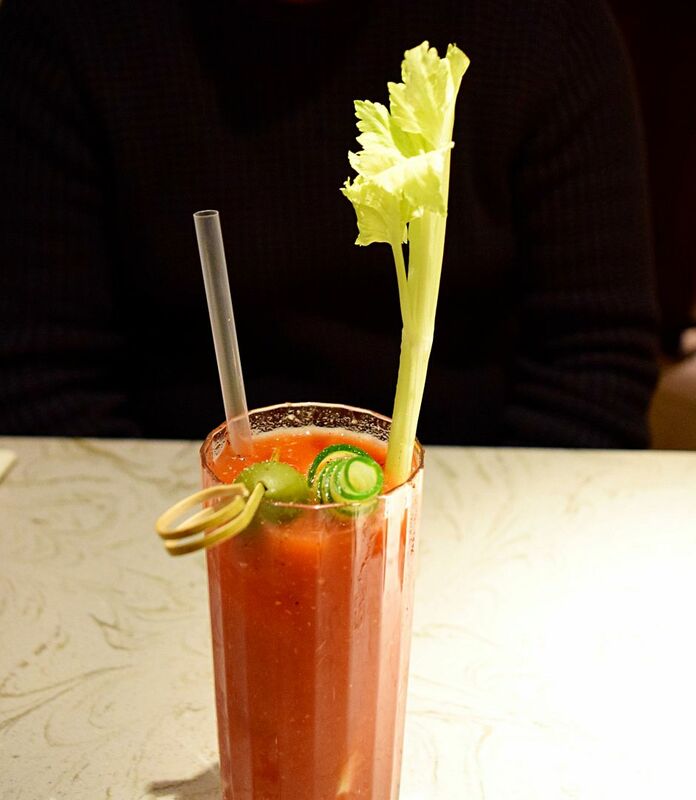 For more info on 100 Wardour Street brunch and restaurant visit www.100wardourst.com. Shame about the ‘new’ feeling to the restaurant – but I guess that’s just teething problems eh! That pasta sounds and looks AMAZING though!